Little Blue Tower ~ Welcome, fellow Traveler. 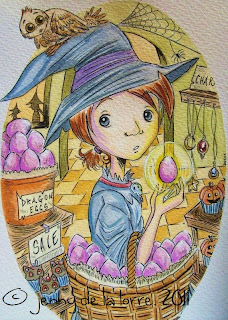 Wander into the art of *Jennifer De La Torre*: "Witch Market"
The sixth Witch Apprentice Halloween card! You've got to wonder what she plans on doing with all those dragon eggs, huh?